Tarazod Films & Media LLC: Mad City Chickens Australian Premiere set for July 18th! Mad City Chickens Australian Premiere set for July 18th! 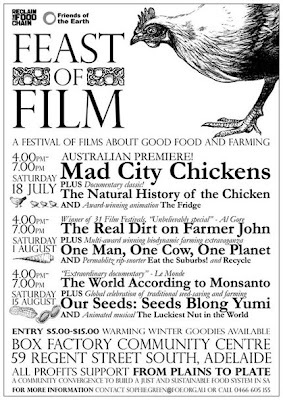 Mad City Chickens will make its Australian premiere on July 18th as part of the Feast of Films, a series of film screenings where all proceeds go to support From Plains to Plate, a not-for-profit community group that works on issues of food and agriculture in Adelaide, South Australia. More details to come.